On the 20th August a group of 'Myerscoughs' got together at the Red Pump at Bashall Eaves near Clitheroe. Agnes Myerscough organised a small Myerscough get together of people that she has had contact with over the years. 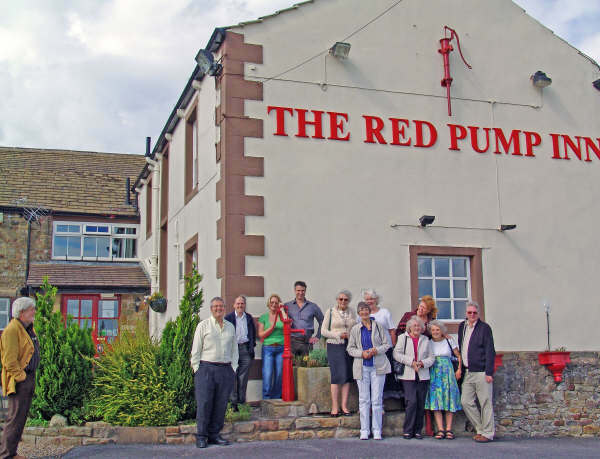 The venue that was chosen was the Red Pump at Bashall Eaves. A very appropriate choice as the Host and Hostess are Jon and Martina Myerscough and the Red Pump is very close to one of the Myerscough family seat's - the home of John Myerscough (1675-1754) and his wife Ellen. John was a farmer and is buried in nearby All Hallows at Mitton. 13 people were able to get together - Agnes Myerscough, Jon Myerscough and Martina , Michael Myerscough and Margaret, Sheila Myerscough, Sheila McDermott (Myerscough descendant) and Steve, Barbara Lupton (wife of Myerscough descendant), Roy and Linda Ashcroft (both Myerscough descendants), Melanie (Myerscough descendant) and her husband Ron. It was a wonderful afternoon spent swapping Myerscough yarns and getting to know our cousins!! reunion and get more Myerscoughs along!! !